Sometimes, however, the designer's message is not clear to the users, and there are reports of users who handled devices or used applications in unexpected ways (as far as the designer is concerned)... I fear that there are also instances where the users don't even think of the designer at all. For example, if users say that a device "works as expected" they exhibit a user-centric perspective based on their own expectations. An open question is: Where do these expectations come from? Do they come from the the users' prior exposure to similar objects, from advertisements, or from the secret messages of the designer's deputy, as Sieckenius de Souza would formulate it? I do not know the answer but I see that you can take two opposed perspectives, a designer-centric and a user-centric one. Both perspectives mark the extremes on a "designer-to-user" scale. I mentioned already the user-centric perspective: you do not care for the designer at all. The opposite perspective would be to place the designer above all. Typically, we call this approach "art," and we celebrate artists in many ways for their works. In between, there lies a wide spectrum, ranging from "pure design," for example, installations in museums that "make people think," to industrial design, for example, vacuum cleaners, coffee cups, or IKEA furniture, to – you name it – user interface design, that is, the design of software applications that should NOT make users think. Instead, UI designers strive for enabling users to perform their tasks efficiently and without much pondering. Along the "designer-user" dimension, the name recognition of the designers decreases: Artists are typically well known, designers who feel like artists not as much. While there are some famous industrial designers, such as Luigi Collani in Germany, there are only few user interface designers who are known to the public – despite all the "About boxes" in applications that tell their names. Sometimes, however, I would like to know who designed a device that I have to use, particularly, if it does not work as I expected. (Look at my user-centric perspective!) "What moron" designed that, I would exclaim in such cases. Let me tell you an example. Recently, I trespassed a very design-bearing area: I visited the "Innovationsforum Interaktionsdesign" in Potsdam, Germany, which definitely boasted a high concentration of designers per square meter. No wonder that this concentration radiated into other areas of Potsdam, such as the hotel where I stayed – appropriately named art'otel. 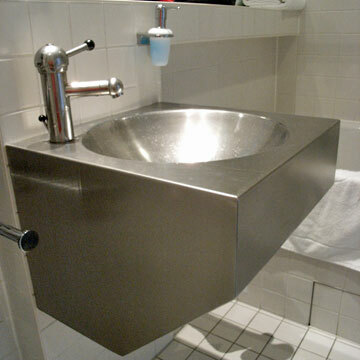 In the bathroom, my apartment featured a "designer washbasin" made of steel. I dared to "deconsecrate" the washbasin and washed my socks in it. However, when I pulled the lever to close the drain, nothing happened – the lever had no effect. 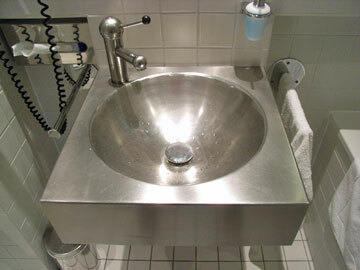 I washed my socks anyway but was annoyed because that "damned" washbasin did not "work as expected." 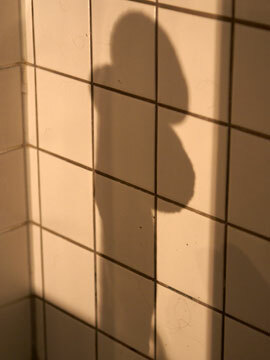 Figure 3: No, not a sculpture in our our hotel bathroom – just the shadow of the "designer faucet"